Why Is the Human Up So Early? I cannot imagine how difficult it must be to have to flee your home and leave everything you have known behind due to many humans shooting at each other. This is what happened to a family living in war torn Syria. They fled from Syria to Lesbos, Greece. One thing they took with them was their beloved tabby cat, named Zaytouna. These humans did not even have a carrier to put their feline in. Instead, during the entire trip, one human held Zaytouna to their chest for the entire boat ride. When they reached the shore, they celebrated, but they also made sure that they calmed Zaytouna. These humans carried Zaytouna in a sling they crafted for weeks as they made their way from Greece to Germany. When they arrived in Germany, Zaytouna, which is Arabic for Olive, was put in quarantine. These humans did not know where their beloved feline was going or when they would get her back. One day, these humans received a visitor from the government. It was a white coated human, with Zaytouna. She was three months older, but she was very happy to be reunited with her humans and they were ecstatic. “She is healthy and with us and I haven’t felt this happy in a long time,” said one of Zaytouna’s humans. Furiends, I am very happy that these humans cared enough to make sure they took their feline with them when they left their war torn country behind. And I am even happier that she is now living with them once again in a much safer environment. Whether I am missing the point or not, I think it is good that you humans have set aside a day that is just for mothers. We felines generally do not know our mothers for very long, and we typically leave them after a few months. When we stay with our mothers, the bond becomes very strong. In fact, a feral feline decided that she would introduce a human to her kitten and made the human take them both in! 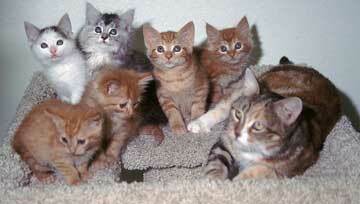 And on mother’s day, it is also important for us felines to recognize the foster moms who help us. Rescues could not do their good work without fosters to give felines a home to stay in before we go to our furever homes. It is also very important for us felines to thank our adoptive moms on mother’s day. After all, they are the ones who make sure we have a furever home, where we are safe and surrounded by love. To all the mothers out there, whether they are four legged or two legged, foster, natural or adoptive, I hope you have a happy mother’s day!